My daughter, sister and myself had a wonderful time. The weather was gorgeous all day. The crew was fantastic. We saw lots of animals...birds, seals and even some orca. Could not have asked for a better tour and would highly recommend to friends and family. It was a cloudy, rainy, cold day. We had large sea swells that rocked the boat, however, we did see a whale, sea otters, sea lions, eagles, starfish, puffins, and other birds. The food was delicious and the staff was pleasant and helpful. Lots of wild sealife and beautiful ocean view!! But buffet was not so great:( I will definatelly do it agin. 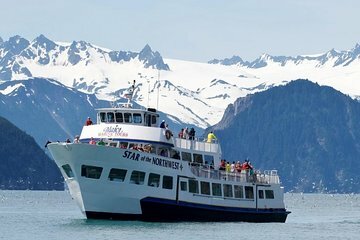 We took the 5hr cruise on July 2nd -12 travelers ages from 10 yrs old to 80 yrs old and from start to finish this tour was top notch- from the representatives on the phone to the ticket reps in the office -Boat Staff and Captain- I cannot say enough about this tour. They even had a Park Ranger on the boat who answered many questions from my family and others on the tour and did a narrative throughout the cruise. Also, they had a Junior Ranger activity and ceremony for the kids and big kids which was a lot of fun- Not a bad seat on the boat and you were able to move around freely and the Captain did a wonderful job of maneuvering the boat around so everyone can see. We saw Humpback Whales- Eagles- Sea Otters and Seals—AMAZING!! The buffet was also a great added option and it was delicious and more so when you realize it is all cooked on the boat in a small area. OUTSTANDING.. This was our #1 tour that we took on this trip. Definitely Recommended!!! Great tour , great commentary, and always have the lunch, Atlantic wild salmon, best salmon in the world. This cruise was amazing! We got to see sea lions relaxing on rocks, also eagles hunting fish and the most important- whales!!! Nature is spectacular all around, buffet offering salmon was delicious. Take a jacket - its windy. Definitely recommend this one! We had a bad weather day but that does not take away from the adventure as a whole. The whole experience went well otherwise. Boarding was easy, seats were assigned, 4 of us in our party with backpacks and felt comfortable leaving then at our table when we went outside for viewing. Buffet was great, first time around they call you up by table number after that you can go back for seconds. Same thing for dessert but reverse order. The Rangers on board were helpful in telling the story of the area and very knowledgeable. Lots of room on board when outside on deck even with a full boat.Other than the bad weather Overcast raining and 45 the trip for 5 hours was great. Would have like to see some whales but can control the sea life. The company and crew were top notch. The tour was great! The crew were engaged during the entire trip, and VERY enthusiastic when orcas were spotted! 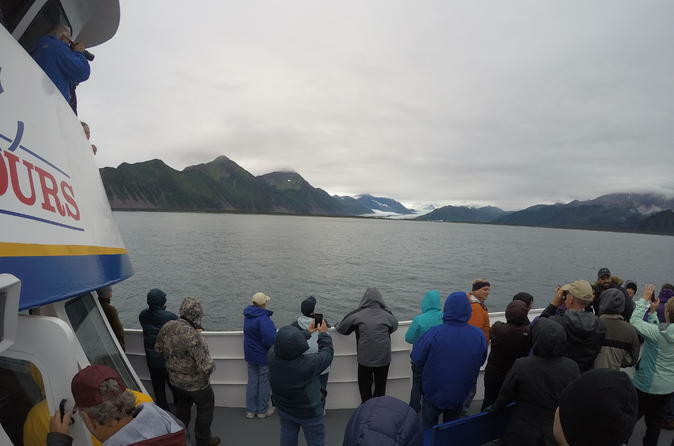 There was a national park ranger on board who helped spot animals and educated us about the animals in the area, and answered questions. There was a biologist from the aquarium on board as well who was another good source of information. There were lots of outdoor viewing locations at the upper levels of the boat, and windows along the seating/dining area. We saw lots of animals....and I'm sure that the marine animals that you see will vary due to time of the year and luck, but we were very fortunate to see LOTS on this tour. Having access to loaner binoculars was a great feature of the tour. The buffet was very good and there was plenty of food for everyone. The captain and crew were really great and helpful and we saw SOOO many great sights sea lions, orcas, sea otters, jellyfish, seals, bald eagles!! The only reason I'm not giving it 5 stars is that we were seated with another family we were a family of 3 and had to share a table the whole time with another family of 3. For the price, we were upset that most guests had their own private table..but we didn't---so I would insist on having your own table when booking. It was disappointing, but overall the trip, sights, and food was great.